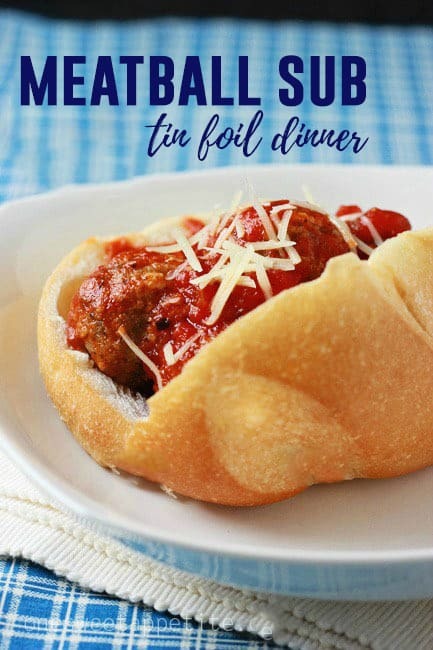 This foil pack recipe for Meatball Sub Tin Foil Dinners is the perfect easy camping recipe! 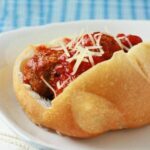 Homemade meatballs are cooked on warm coals, topped with cheese, and placed in a roll for a filling meal! Homemade meatballs cooked in a tin foil packet with your favorite sauce – Easy and delicious! This recipe is one of my favorites to take camping. It has minimal ingredients and tastes fantastic. The hardest part is mixing the ingredients for the meatballs, which only takes you about 10 minutes! I highly suggest making the meatballs ahead of time. They are freezer friendly which means you can make them weeks in advance! When you are ready to head out all you have to do is grab the container and toss it in your cooler. Serve these meatballs as a sandwich or on top of your favorite pasta. Either way, you will love this classic comfort food recipe! What do you put in tin foil dinners? Great question! Really, what CAN’T you put into a tin foil dinner? We have tried a wide variety of vegetables, rice, frozen french fries… Just be sure to check your tin foil dinner while it is cooking regularly and ensuring even cooking. Double up on your foil if you are planning on using it as the container or plate. If you are looking for some great inspiration on what kind of meals to add to your camping menu, make sure to check out my cookbook! Foiled! Easy, Tasty, Tin Foil Meals is packed with great ideas from breakfast to desserts! Line a large cookie sheet with tin foil and lightly mist with non-stick spray. Combine the first 11 ingredients in a large bowl. Mix until combined. Form into 1 inch balls (I use a small cookie scoop) rolling between your hands to form circles. Place onto your prepared tray. Broil until your meatballs are just lightly browned. AT HOME COOKING: Place your meatballs in a saucepan. Cover with your favorite spaghetti sauce and simmer for 30 minutes. Place onto the rolls and enjoy. IF FREEZING FOR LATER USE: Remove from the oven and when your tray has cooled place in the freezer for twenty minutes. Place your meatballs in a freezer bag and store. CAMPING: Create four rectangles of heavy duty foil. Fold up the sides creating a 1 inch rim. Spray your containers with cooking spray and add a bit of sauce to each. Top with your meatballs. Fold up the sides to create your packet. Place your packets onto prepared coals. Cook for 30 minutes making sure to turn a few times. Loving the series so far!! Yay – can’t wait to try this recipe! In the ciabatta or hoagie rolls. Scooping out the bread allows the meatballs to fit inside and easier to handle, especially for young people or elderly. Of course me too. actually essential…There may possibly evidently the most effective lot to be sure you realize more than that. Document good feeling you’ll prepared the most effective areas about characteristics just like…. Your kidding me right? I know for a fact that IBM took its mainframe ops and sent it to Brazil. They maintain very little here in the USA. I am a mainframe operator. I been out of work for over 2 years after being layed off from contact work too IBM. So I know who’s doing my job right now.. Brazil!